A truly magical fusion of tabletop RPG and CCG thats only missing pizza and beerand co-op. Magic: The Gathering and Dungeons & Dragons' snappier offspring, Castle Ravenloft, had a wee babe. 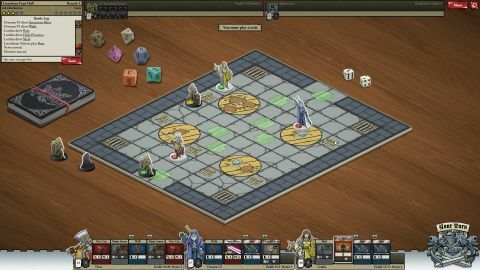 They named it Card Hunter, a hybrid tabletop RPG/collectable card game (CCG) that's packed with great deck building and some dungeon crawls that are almost as good as the real thing. CH plays and feels like a standard tabletop RPG, except this one lives in your browser and is completely free. The twist is, all of your abilities (movement, attacks, blocks) are tied to a CCG rather than a typical stats sheet. Imagine it like playing Monopoly, but instead of rolling the dice to move around the board, you play a card to decide what happens next, like turning the B&O railroad into a stinking pit of body odor that causes instant death for landing on it for three turns. Each piece of gear has several cards that give the item its properties: boots may give you a “walk two spaces” card, or “block three damage on a roll three or higher,” in the case of a shield. It's these cards that make up your deck, and give you actions you'll use during each turn. For example, down in a festering sewer of flaming skeletons and pudding monsters (they're scarier than they sound) my three-member party draws opening hands. Thror the dwarf warrior draws two armor cards, a walk card, and a stabby spear that deals five damage. I use Walk to move him across the board and near a wild-eyed yellow pudding, which is basically a typical RPG slime with banana flavoring and growth hormone added. Next, the pudding uses an attack card to deal damage with his slimy tongue, and send one of my armor cards to the discard pile. Luckily, Thror's other armor card absorbs all but two of the pudding's damage. I have the dwarf lash back with the business end of a spear, but not before my priest augments it with two buffs, Righteous Frenzy and Unholy Frenzy, which each give plus two damage to melee attacks. With one amoeboid appendage already in the grave, the pudding's getting scared, but it's out of move cards. Instead, the AI tries to get my dwarf to back off by edging its skeletons in closer. It's too late, though. I have my wizard finish the pudding off with Sorcerous Blast—electrifying eyeball lasers that toast the jiggling blob from six spaces away. With both sides out of actionable cards, we pass our turns and move on to round two in order to draw fresh cards and continue the mayhem. All of this action takes place on a charming set of simulated game tiles laid out on a wood table cluttered with various gaming paraphernalia such as dice bags and soda cans, while characters are represented by cardstock figures pegged into plastic stands. With the amount of detail that's gone into every facet of Card Hunter's look and feel, it's not hard to sense the love that developer Blue Manchu has for the genre, which is why the pricing is so hard to believe. You can play the considerable single-player campaign and multiplayer without dropping a dime. In-game currency takes the form of pizza slices ($5 per 150 slices) which can be used to purchase random loot chests, new figures, and special quest modules that drop epic level loot. You can also spend that steamy money-pizza on a Club Membership, which grants an additional item upon completion of quest modules for a set period of time ($10 for a month to about $76 for a year). Despite the additional goodies, I never felt like I was missing out by not spending money. Notably, there are no cards for purchase, unless you count the extra items earned from membership. This means the only way to grow your deck is by playing the same free content that's available to everyone. It's a remarkably ungreedy design choice that makes multiplayer in particular a tense and satisfying experience. MP works in much the same way as the campaign except the enemy AI is replaced by a person, and it's where CH's CCG chops really shine. Player parties are set to the same level, but you can gear them out however you like. You can build incredibly varied decks from damage/control to discard. Against experienced opponents, the game starts to feel less like a D&D duel and more like a game of Magic, packed with strategy, desperation and unbelievable comebacks. Blue Manchu also packed in an easy to use scenario editor that lets you build your own dungeons and quests using all the assets in the game. Currently, you can only use the scenarios you create for PvE and competitive multiplayer—it's nonetheless the CH feature I'm most excited to see let loose in the wild. CH has but one fault that really irks me—there's no cooperative mode. That's a big irk. The story-based campaign, which feels so much like the tabletop games my friends and I enjoy on the weekend, is especially painful not being able to share. In a genre where the wonder of live creativity is so integral to the experience, playing alone sometimes feels like you've sat down to Thanksgiving dinner and suddenly realized you've forgotten the turkey. Everything else on the table is delicious, to be sure, but missing such an important ingredient leaves me still hungry even after the custom map pie. If Blue Manchu can figure a way to get co-op into this thing, they might just have the best board game without a board of the decade on their hands.